Coral reefs occur in tropical regions where the mean surface temperature is above 20°C. Coral reefs are either restricted or absent from along the west coast of the Americas, as well as the west coast of Africa. This is due primarily to upwelling and strong cold coastal currents that reduce water temperatures in these areas (Nybakken, 1997). Reefs are also restricted along the coast around north-eastern South America and Bangladesh due to the release of vast quantities of freshwater from the Amazon and Ganges Rivers respectively. 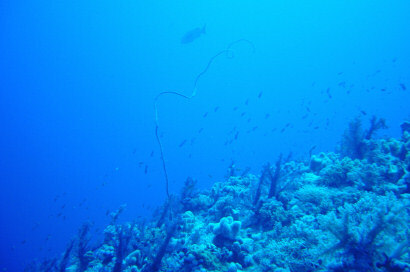 If we look to vertical distribution living reefs do not get deeper then about 60 meters. Deeper there is not enough light for their symbiotic algae to live. Worldwide there are about 800 reef building species. These species are not evenly spread over the tropics. The "Indo-Malayan triangle" accounts for 600 of them, this area is referenced as the "Coral triangle" or the "Center of marine biodiversity". The total number of plant and animal species on tropical coral reefs is unknown. Roughly estimated it is thought to be a million. There are approximately 4000 coral reef fish species (¼ of all marine fish species). 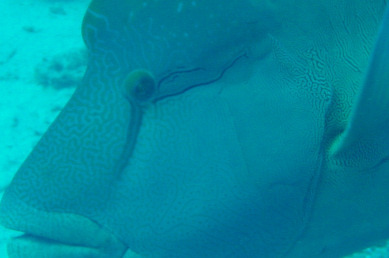 Many of these reef fishes prey on invertebrates on the reefs. For this reason reefs look poor on invertebrates, but that's not true, they just hide themselves. 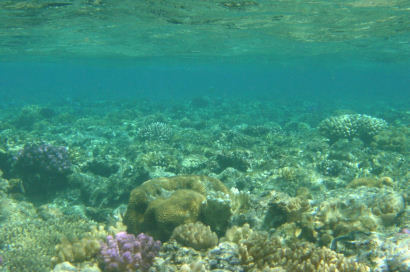 In the less deep parts of the fore reef the conditions are favourable for most coral species. Particularly the intense sunlight and the good mixture of water attribute to their growth. Fish are abundant, their feeding conditions are good and there are enough hiding places. Fore reefs in strong wave conditions form alternating vertical ridges (buttresses) and channels. The ridges are formed by branching corals; seawater and debris can drain off the reef into deeper water through the channels. 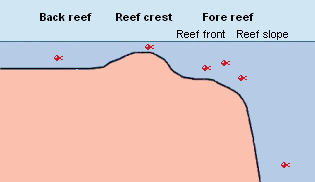 If this topology occurs this part of the reef is referred as the buttress zone. Continuing down the seaward slope to about 20 m, optimal light intensity decreases, but reduced wave action allows the maximum number of coral species to develop. At these depths corals tend to grow in flat, plate-like formations. Although most scientists agree that this is an adaptation to the lower light levels, an exact explanation is still disputed. Below 30 to 70 m depth sponges, sea whips, sea fans, and not-light-dependant corals become increasingly abundant and gradually replace the reef building corals. The reef crest is the highest point of the reef. On reefs where the wave action is moderate this zone is dominated by branching reef species like Acropora and Millepora. If the wave actions are more severe the reef crest is dominated by encrusting calcareous red algae forming an algal ridge. The back reef, is located on the sheltered side of the reef. It extends outward from the shore to the reef crest or, in the case of atolls, it forms the lagoon. Because it is so shallow, this area experiences the widest variations in temperature and salinity. Reduced water circulation, the accumulation of sediments, and exposure to air and direct sunlight during low tide, limit coral growth. The substrate is formed of coral rock and loose sand. Beds of sea grasses often develop in the sandy regions, and both encrusting and filamentous algae are common. Although living corals may be scarce except near the seaward section of this zone, its many microhabitats support the greatest number of species in the reef ecosystem. 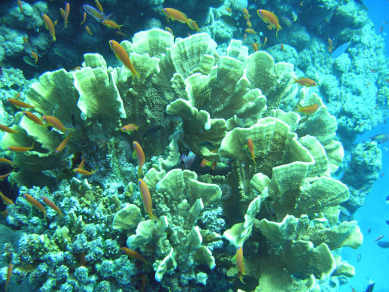 Coral reefs can be seen as the oases in marine deserts. 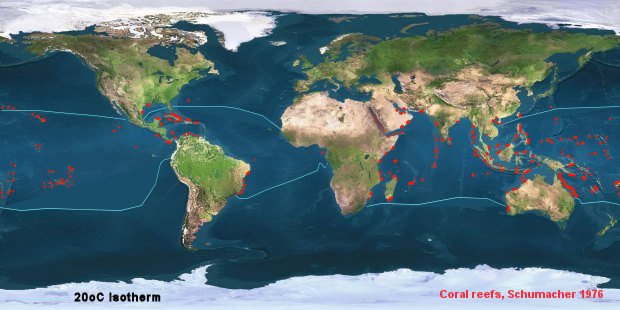 The surrounding seas are extremely poor in nutrients and hence, they have a low productivity. So how can coral reefs belong to the most productive areas of the world? This subject is still much debated among scientist but must it have to do with the extreme efficiency of the food chain. 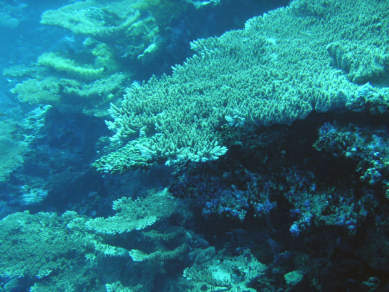 Zooxanthellae (plant cells living in the coral polyps) produce a considerable amount of organic matter that is transferred directly to the coral tissues. Apart from this food source corals use their numerous polyps to catch food particles floating in the sea. Zooxanthellae aren't the only (food producing) plants on reefs. Large algae may win the competition for space with corals and form algal mats. Calcareous algae are important because they cement the corals together to form a firm reef. Also many microscopic algae live attached on different species. Large algae are so heavily grazed by fish and invertebrates, primarily sea urchins, that it appears that they aren't present. But if you look closely youll find them. Many herbivorous fish species graze on these benthic algae. These grazers are very important to the reef, where they disappear corals are rapidly overgrown by algae. The herbivorous fishes and invertebrates, together with the coral polyps form a good food supply for carnivorous species. To better understand the feeding habits all those fishes on the reef use the link. Many coral reefs are millions of years old but nowadays they are severely threatened. Only about 20% of world reefs seem not to be threatened or destroyed. In absence of man reefs are threatened by hurricanes or typhoons and by influx of warmer seawater caused by El Niño. Also biological factors can damage reefs. Bacterial diseases and the somewhat mysterious outbursts of the sea star Acanthaster planci can cause local die-offs. Human activities including development in coastal areas, destructive fishing methods, and pollution have contributed to a global loss approaching 25 percent of these valuable ecosystems. Although 18.7% of the world's coral reefs are within "Marine Protected Areas" (MPAs) less that 2% are within MPAs with sound management. Divers are taught to take care but bad boating habits still do damage the reefs. But probably the biggest threat is not mentioned yet. Global warming is expected to degrade the coral reefs in the decades ahead. Rising sea temperatures increases the frequency of mass coral bleaching events. And the rising level of CO2 gasses in the seawater make them become more acidic. Under these circumstances organisms cannot calcify as well as they did so diminishing grow of the reefs.